A corporate identity is very important and it gives the first impression of your company to the customers. We appreciate Excelling All Stars for choosing us to create their corporate identity designs. The designs feature the company’s bold logo in straight to the point designs. There are no overly lavish decorations that will scare away. Instead, the color palette derived from the company’s logo gives it a look of professionalism. A is very important and it gives the first impression of your company to the customers. 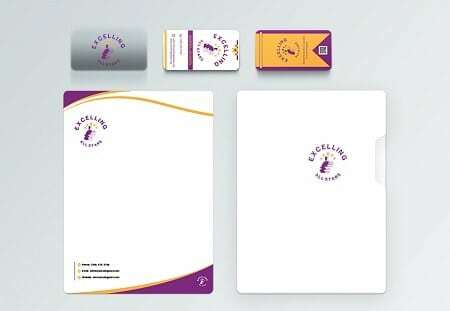 We appreciate Excelling All Stars for choosing us to create their corporate identity designs. The designs feature the company’s bold logo in straight to the point designs. There are no overly lavish decorations that will scare away. Instead, the color palette derived from the company’s logo gives it a look ofA corporate identity is very important and it gives the first impression of your company to the customers. We appreciate Excelling All Stars for choosing us to create their corporate identity designs. The designs feature the company’s bold logo in straight to the point designs. There are no overly lavish decorations that will scare away. Instead, the color palette derived from the company’s logo gives it a look ofA is very important and it gives the first impression of your company to the customers. We appreciate Excelling All Stars for choosing us to create their corporate identity designs. The designs feature the company’s bold logo in straight to the point designs. There are no overly lavish decorations that will scare away. Instead, the color palette derived from the company’s logo gives it a look of professionalism.